The original Pebble is widely regarded as the first successful smartwatch. Funded through Kickstarter, it quickly became one of the most funded projects of all time, and to date over a million Pebble units have been sold. In late 2015, the Pebble team introduced Pebble Time Round, the company’s first smartwatch featuring a classic round design. As an original Pebble owner, I was very eager to get my hands on the latest offering in all its thin, round glory. After using it for roughly a month, I am convinced that the Pebble Time Round is by far the best smartwatch I have ever owned. 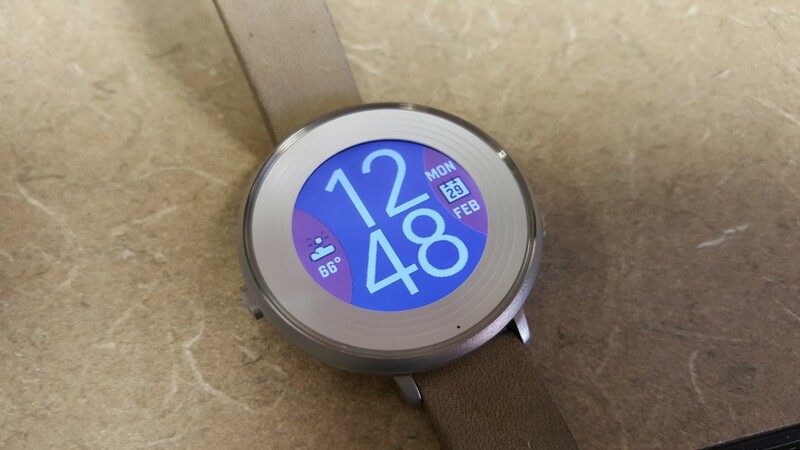 Without a doubt, the Pebble Time Round’s biggest selling point is the design. The team at Pebble clearly put an extraordinary emphasis on the look and feel of the watch, and it shows in every facet of the device. As the name indicates. 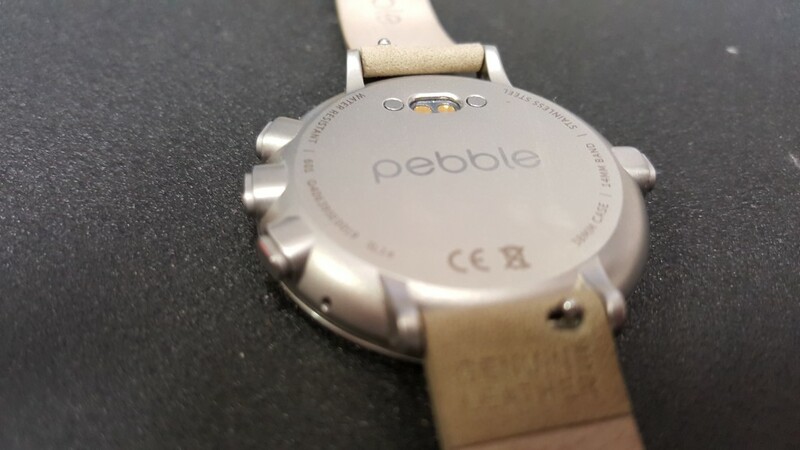 Pebble Time Round features a round face encased in a 38.5mm stainless steel body. The color e-paper display measures 1.25 inches, and features a decent size bezel around it as well. The signature 4-button layout is found once again here, and owners of previous Pebble watches will surely find that a welcome treat. 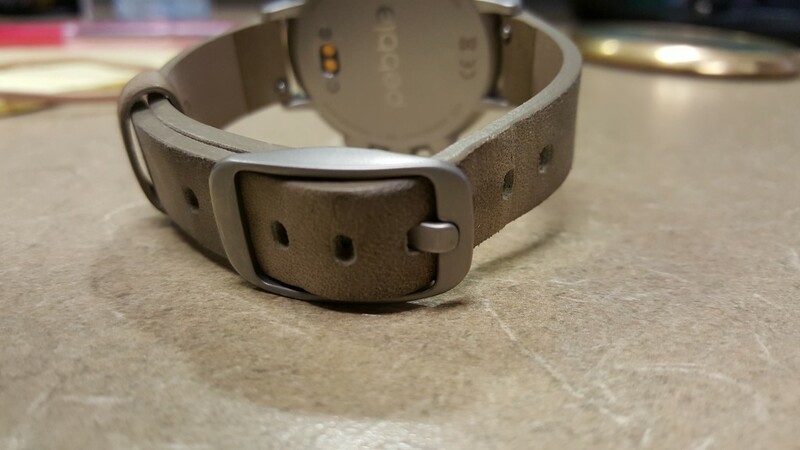 The watch band is secured using standard quick-release pins, which makes replacing the band fairly easy. Around the back of the case is a Pebble logo, typical device and FCC information, and the proprietary charging pins that Pebble users will also recognize. The display itself is covered in scratch-resistant 2.5D Gorilla Glass, and the casing is IPX7 splash resistant. Upgrading from an original Pebble, I will admit I was slightly disappointed that the Time Round is not completely waterproof. But after using it for a month, I have come to accept the small sacrifice in the name of pure, beautiful design. Weighing in at only 28 grams and measuring 7.5mm thick, this watch is ridiculously thin and light. Pebble touts it as the world’s “thinnest and lightest” smartwatch, and it’s hard to argue that point. Pebble Time Round is so light that after wearing it for a few hours, I legitimately forgot that I was wearing it until I received a notification and the watch vibrated. 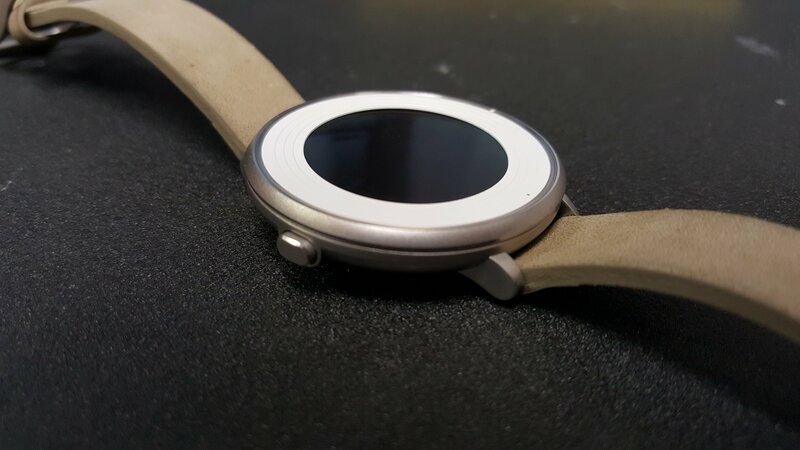 That isn’t to say that the Pebble Time Round is too light. I found that after getting used to wearing it all day, the weight actually strikes the perfect balance between being light and durable. Coming from a 1st gen Moto 360, which weighs nearly twice the PTR at 49 grams, it was a noticeable shift. 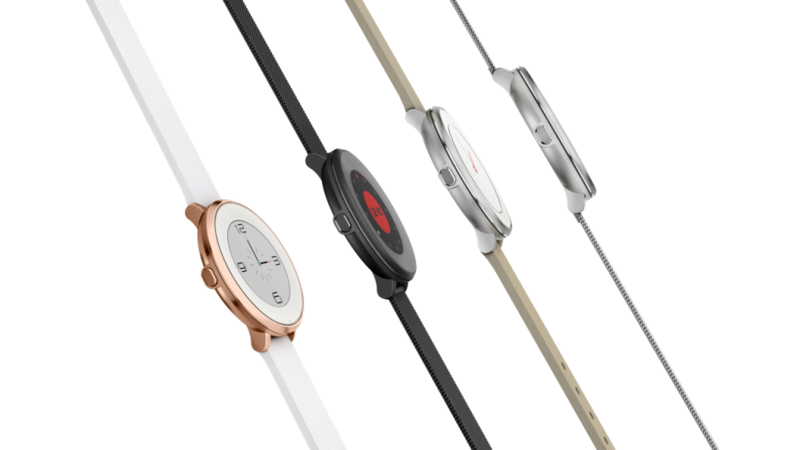 Pebble Time Round is available in eight different configurations, with two different band sizes and two different band materials. The three case colors include Silver, Rose Gold, and Black. Users can choose leather or metal bands, although the metal bands are only available in the smaller 14mm size. The 14mm versions come in Silver (with Stone Leather or Silver Mesh), Rose Gold (with White Leather or Rose Gold Mesh), and Black (with Flame Red Leather or Black Mesh). The larger 20mm version is available in Black with Nero Black Leather or Silver with Nubuck Brown Leather. It is worth mentioning that depending on which configuration you choose, the bezel around the display will have a specific look. Even between the two larger versions, the bezels differ quite a bit. These design choices may play into a user’s choice in size and band material. Being a fan of minimal design (and not a fan of the rose gold trend), I chose the 14mm Silver with Stone Leather version. 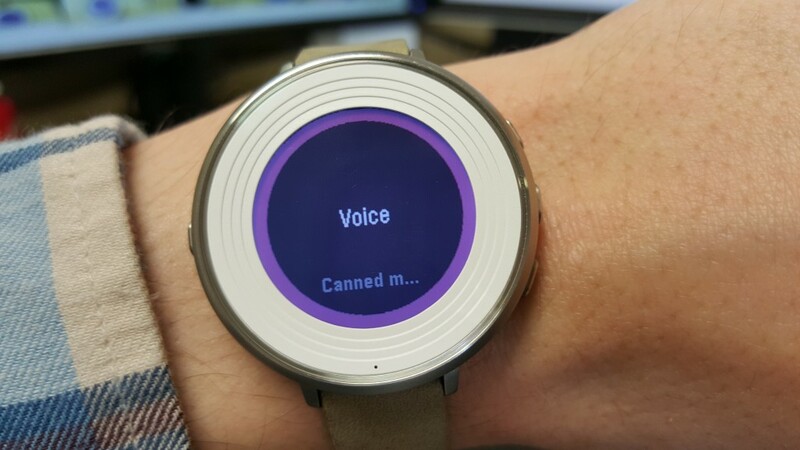 PTR utilizes the Timeline software introduced with the original Pebble Time last year. The UI is fairly simple to use, and I found myself checking on calendar appointments regularly via the Timeline. The video above, courtesy of Pebble, explains in basic form how Timeline works. In a real usage setting, Timeline is simple and especially useful if you integrate apps into it. For example, I have downloaded an app that gives me a word of the day, right in my Timeline. Another app gives me events in history that happened on a particular day. These are just a few examples of the various apps that are capable of integrating with Timeline. Beyond the calendar-centric UI, users can access all their apps and default categories by pressing the center “Select” button on the right side of the watch. Out of the box, PTR breaks everything up into seven centers of information: Settings, Health, Music, Notifications, Alarms, Watchfaces, and a Send Text option that does exactly what the name suggests. Each of these is pretty self-explanatory, likely owing to Pebble’s philosophy of simplicity. The settings seem less cluttered with Timeline than they did with the original Pebble, which was a nice surprise. As a user who gets notifications regularly, I found that the Pebble Time Round does exactly what it’s supposed to do: show me notifications to save me from pulling my phone out of my pocket every few minutes. While Pebble Time Round may lack a touchscreen and Google integration a la Android Wear, as a smartwatch it performs exactly as it should. I receive a high volume of emails on a daily basis, which is one of the major reasons I wear a smartwatch almost every day. 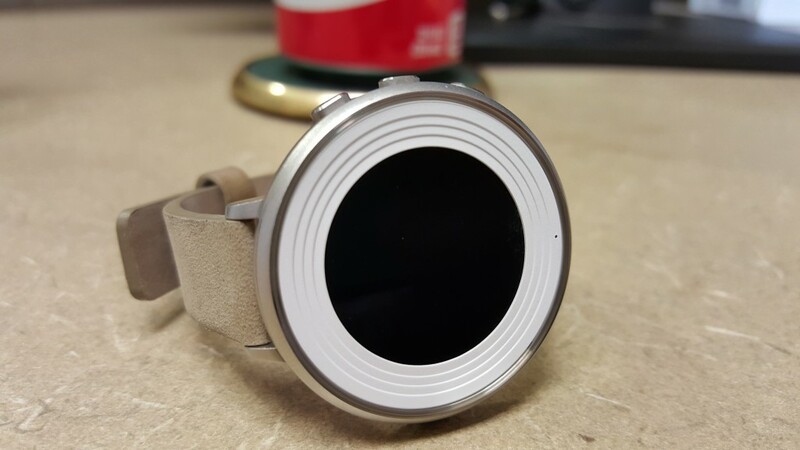 With the original Pebble watch, I discovered that emails received through Google Inbox (my primary email app of choice) did not show as notifications on the watch. This baffled and frustrated me to no end, because it seemed to defeat the entire purpose of the smartwatch in my case. Thankfully, PTR shows me every notification from every app, including emails in Inbox. I have also noticed that the commands available for each notification appear to match the expanded commands within the notification on my smartphone. As an example, when I receive an email, I can mark it as “Done” or Reply All through the notification. 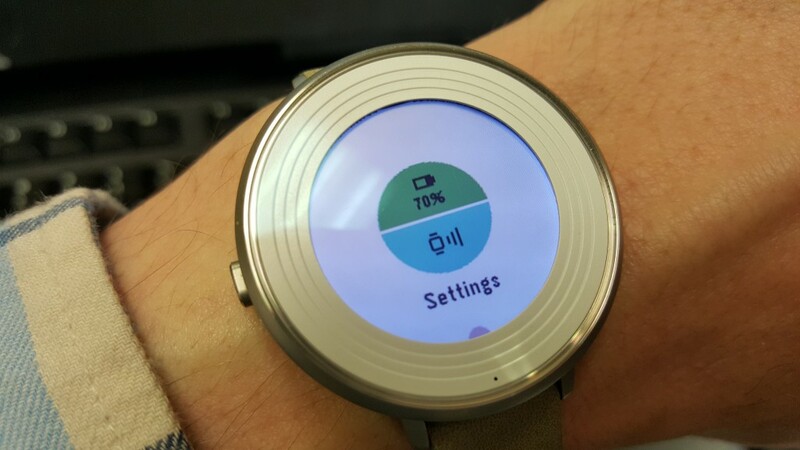 On the Pebble Time Round, I get the same options. This may seem like a small touch, but for a heavy user like myself, I found it to be a serious time-saving feature. Notifications will appear on the watch and stick around for roughly thirty seconds if not dismissed or otherwise acted upon. After that time, PTR will simply slide back to whatever the user was previously doing. In most cases, this means that the notification will give way to the watchface. It is worth noting that the notification may go away on the watch, but unless it is dismissed through the commands, it will still remain in the notifications on the smartphone. For those not familiar with Pebble’s notification system, this may be a shift from Android Wear’s card system. The notification will also rest under the Notifications center mentioned before. Using the PTR on a daily basis is as carefree and easy as I had hoped it would be. The color e-paper display gets the job done without leeching much power, and it is very easy to see in sunlight. Once the watch was set up, I had no issues with vibration or delayed or missed notifications. The watch itself is very comfortable, but it also has the benefit of being small and elegant, like a classic timepiece. In other words, I don’t feel as though I have a small computer on my wrist all day. For a smartwatch, Pebble Time Round grabs the attention of people who just admire it as a watch before they realize what it does. I have had many instances of “what kind of watch is that?” and just random compliments on how the device looks. As a college student who lives off-campus, I drive quite a bit. On my commute, I often use my phone for music. 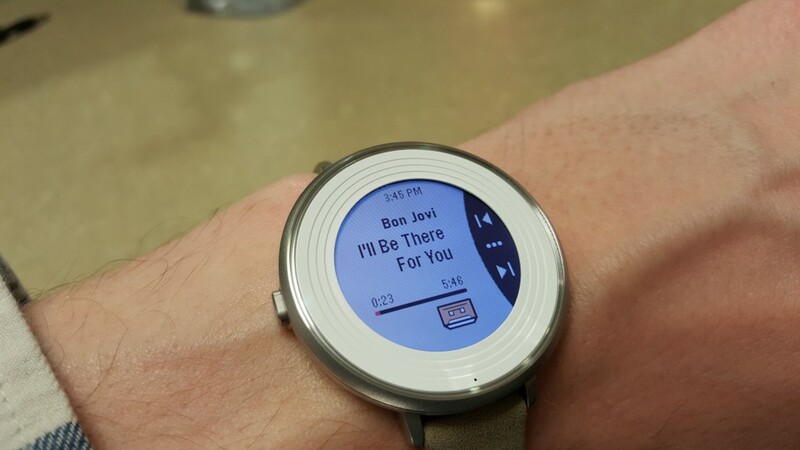 With Pebble Time Round, I am able to skip songs, adjust volume, and pause/play without ever really looking at the watch itself. Since the watch’s music controls utilize the three buttons on the right side of the watch, I can easily remember that the bottom button will skip the song and the top button will go to the previous song. Luckily this system was carried over from previous Pebble watches, so it is essentially second nature to me. Interestingly, I prefer Pebble Time Round to my Moto 360 for music control, because I would rather not have to fiddle with a touchscreen to open the menu that enables me to control songs. I realized in my time using PTR that I take comfort in being able to use the watch for a specific function without worrying about touching the wrong icon or even looking at the screen. Quick Launch is definitely one of my favorite features of the Pebble Time Round. With Quick Launch, users can set two different shortcuts to apps on the watch. These shortcuts are accessed from the main watchface, by long-pressing the up or down buttons. Of course I linked the Music app to one of the buttons, for quick access to the music player. This feature works with the default apps, as well as any additional apps downloaded through the Pebble Store. As with previous models, the battery life on the Pebble Time Round is a big selling point. Pebble watches appeal to users who want more than a day of usage out of a smartwatch, and PTR is no exception. The team behind the watch claims that users can get two days out of a charge, and I found that to be true in my case. In fact, two days might be a slight underestimation of the battery life. I am usually able to get nearly three full days of usage before the watch needs to be recharged. 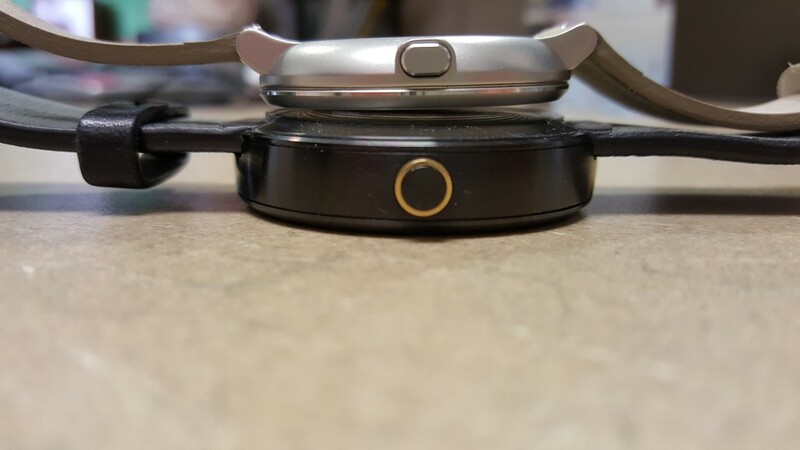 Speaking of charging, the Pebble Time Round uses the same proprietary magnetic pogo pin charging system found in previous models. Simply line up the connectors with the pins on the charging cable, and the magnets do the rest. I managed to charge the Pebble Time Round from 0% to 100% in just over 20 minutes, which is very impressive. Pebble claims that 15 minutes on the charger can give a user an entire day of usage, and that certainly falls within my usage. The Pebble Time Round was launched at $249, putting it in the same price range as some of the more well-known Android Wear watches on the market. 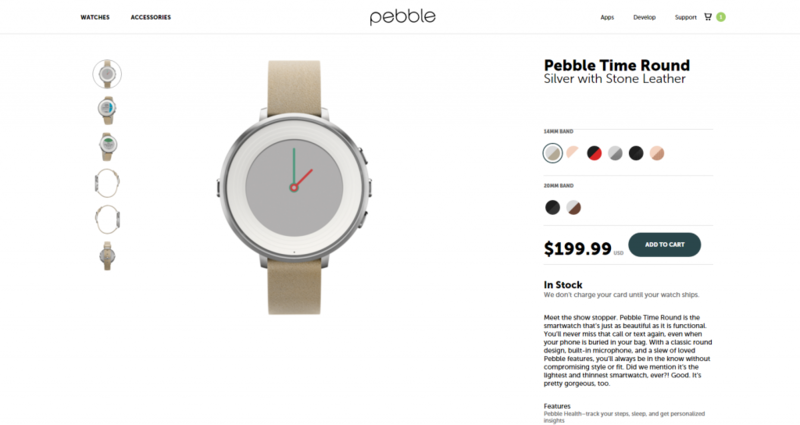 As of March 1st, Pebble has permanently cut the price of PTR from $249 to $199. This is a welcome cut, as it knocks the watch into a more reasonable price range. While it is nearly impeccable in design, a $250 price tag was arguably too high to lure customers who don’t want to spend close to $300 on a smartwatch. For what it’s worth, I managed to purchase my Pebble Time Round during a flash sale via eBay, and it only cost around $190. Pebble regularly has specials and sales, so if the price is a bit steep, I encourage potential buyers to keep their eyes on special promotions for a discount. PTR brings a lot to the table that makes it stand out in a crowd of Android Wear watches, but not every feature is well-executed or even useful in some cases. For example, the watch is able to dictate replies to messages and emails through voice. The microphone on the face of the watch does decently well with understanding what I want to say, but it simply isn’t a feature I use very often, if ever. This is true for the voice commands on my Moto 360 as well: I simply don’t feel the need to voice my reply to a message. While I am impressed that Pebble packed a microphone into the watch, the lack of one would not have been a concern for me whatsoever. Obviously this differs from user to user, but voice commands and message replies are not what sell me on a device. 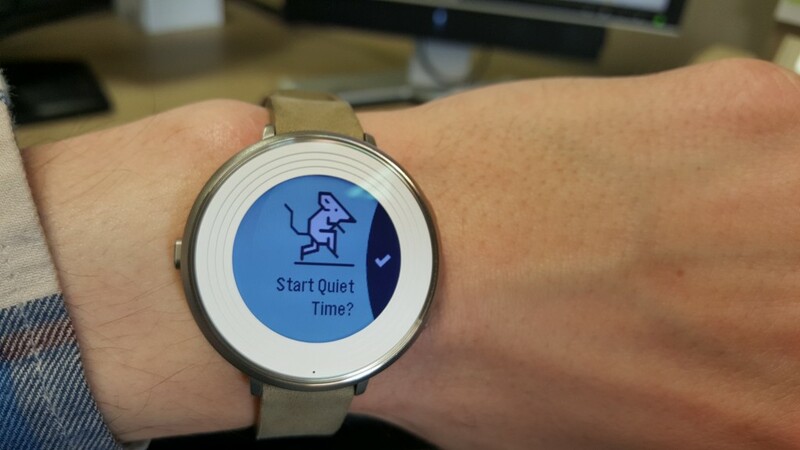 Pebble also included a feature in the Time Round called Quiet Time, and it essentially turns off the vibration for the watch until the user “ends Quite Time” by disabling it. Users can also set schedules for Quiet Time within the settings. While it is good that the watch can be muted in some way, I found it inconsistent with the notification mute systems on most Android devices. When I set my Galaxy S6 on Do Not Disturb mode (I have it on a schedule for my classes), it does not carry over to the Pebble Time Round. Whatever notifications I receive will still show up on the watch, accompanied by vibrations. It would be much more useful if Quiet Time integrated with Do Not Disturb mode or even the Priority/None notification system in Lollipop and Marshmallow. Of course I can set a schedule for Quiet Time that coincides with my classes as well, but that does not solve the problem for non-scheduled Do Not Disturb instances. As a nitpicky point, I had issues with my watch band’s clasp when putting on the watch. For some reason, the metal tongue of the buckle (the small peg that goes through a hole in the band) does not move very easily. With most watches, simply pushing the band through the buckle will move this tongue. But with my particular watch, I had to physically move it myself before passing the band through the buckle. This is by no means a huge issue, but I found it frustrating in rushed situations. It is worth noting that it may be a fluke in manufacturing with my specific unit, or it may be limited to the leather band that came with my watch configuration. Pebble Time Round is the first round smartwatch from the company, and it certainly does not disappoint. While a few of the software features may be slightly inconsistent (or niche-based, like the voice commands), it is an incredible watch in both form and function. Battery life isn’t as astounding as previous Pebble models, but three days with heavy usage is still impressive in my book. The build quality and design are excellent, and the watch feels premium in every sense of the word. In stride with previous models, the Pebble Time Round does exactly what it needs to do. For users who want a useful smartwatch with solid battery life, a simple OS, and an abundance of design choices, PTR is definitely worth taking a look at. The price is a bit high considering the competitors in the market, but in my usage with the device, I concluded that it was worth every penny. You can purchase a Pebble Time Round directly from Pebble.com here.